Athos sEMG compression apparel measures muscular activation so our coaches can quantify their athletes internal training loads and understand which muscles are doing the work. One of the questions we often get from coaches is, “Why do eccentric contractions require less muscular activation?” The goal of this blog is to address that question and show how coaches can use Athos to better understand the athletes they work with each day. Eccentric contractions exhibit high force at a low energy cost. (Ortega et al., 2015) So when comparing phases of a movement, the eccentric or lengthening contractions require less EMG than concentric or shortening contractions. Here are a few pieces of background information that can help us understand why that is the case. 1) Muscle force is the result of the number and rate of motor unit recruitment. To increase muscle force, more motor units are recruited and the rate of activated motor units is increased. sEMG records the sum of the action potentials from the motor units. Thus, more motor units discharging action potentials leads to greater amplitude in the sEMG. 2) The maximal force a muscle can produce varies as a function of speed. Faster contractions produce less force while slower contractions have the ability to produce more force. Then, there is the point where you are not moving at all, velocity = 0. This isometric contraction would happen when you are pushing against a wall. Any contraction lower than a velocity = 0 is called negative velocity and occurs when the muscle is lengthening while producing force. This often occurs when you are working with gravity. For example, the biceps lengthen in an eccentric contraction when you slowly lower a weight in your hand from your shoulder to your side. 3) Muscles produce more force during lengthening or eccentric contractions because favorable actin-myosin cross bridge cycling stores elastic energy during stretching (Moritani et al., 1987) and large titin molecules increase muscle tension with stretch. (Hessel et al., 2017). Thus, for a given force output, you need to recruit fewer motor units to achieve the desired force because each fiber is already producing more force! The back squat and bench press are great movements to think about the eccentric versus concentric phases of a rep in relation to sEMG. Let’s first think about the weight we can control eccentrically, versus concentrically. When selecting a weight for heavier sets, we usually choose the weight by thinking about what we can push back up, not what we can bring down; studies show we can handle about 1.75x more weight eccentrically compared to concentrically. However, even without knowing that we can handle more weight eccentrically than concentrically, we subconsciously choose the weight for our lifts based off the weight we can push back up. When we don’t select an appropriate weight, lift failure tends to occur in the concentric phase of the rep. 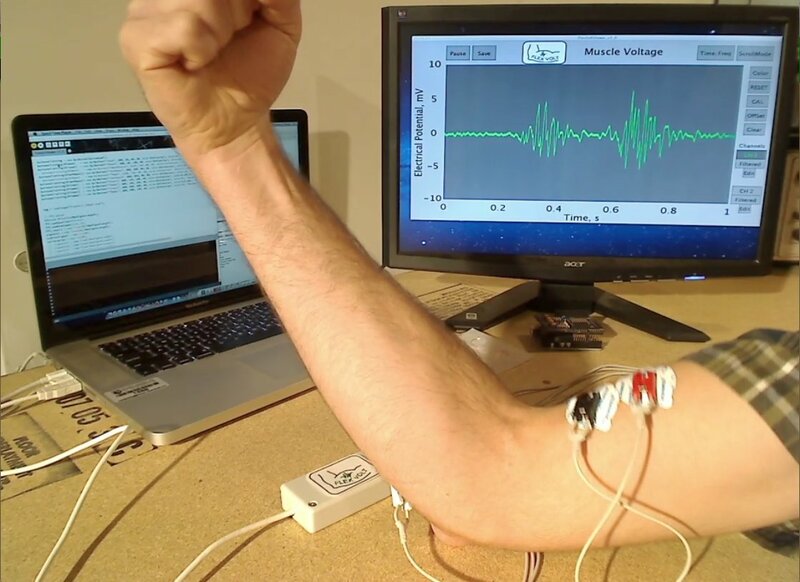 Using Athos live-view to monitor real-time muscle activity in a squat shows less activation in the eccentric phase as fewer motor units are recruited, resulting in lower peak amplitudes. Then in the concentric phase, more motor units are recruited and at high frequencies to the time the athlete pushes to a full stand resulting in higher peak amplitudes of the glutes. Now lets look at the differences in muscle activation between eccentric and concentric movements in the SLDL (single leg deadlift). When looking at the standing leg in comparison to what we categorize as the non-working leg, more real-time activity is typically observed on the “non-working” leg than the standing “working” leg. This can be confusing, but keep in mind. that during eccentric movements the muscle activity, which is a derivative of amplitude and frequency of contraction, is lower. As the muscle fibers of the standing leg lengthens, they are working with gravity to control the resistance to the ground. Then, on the way up, more activity is expected because more motor units are recruited as the muscle shortens as the weight is moved in opposition to gravity. As the muscle fibers shorten and lose properties of active tension and elastic cross-bridges, the resultant sEMG portrays the higher amplitudes and frequency by showing greater overall muscle activity. Now, let’s think about that “non-working” leg. The non-working leg is actually working to stabilize the pelvis, while maintaining hip and knee extension against gravity. 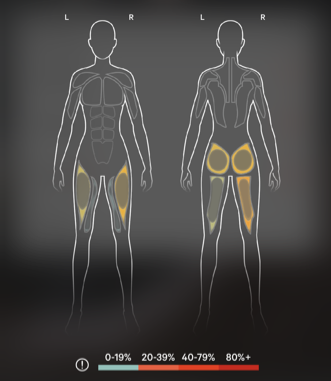 Looking at live-view, you will see the non-working leg display higher levels of muscle activity, more orange-red in the display, while the working leg is moving through the eccentric portion of the rep.
Test It Yourself: Stand up and get into the bottom of an SLDL. Now, tap the back of the non-working leg. You might be surprised how contracted that hamstring is and understand why the real-time muscle activity shows brighter colors on the “non-working” leg. Although the working leg has less instantaneous muscle activity, Athos is still collecting training load which is also impacted by time. In the eccentric portion, the amplitudes are typically lower, but thinking about timing under tension, especially in tempo-training, we are quantifying the total work of the muscle through the controlled rep. In an example of 3:1 tempo training, Athos will show lower muscle activity for a longer period of time during the eccentric portion and then the shorter, higher-amplitude burst during the concentric portion. In the figure below, see how the eccentric phases have less amplitude but longer duration than the concentric phase of the rep.
To dial into the training loads required from eccentric and concentric contractions, we compared three sets broken into the eccentric and concentric phases of the Back Squat and Deadlift. As expected, the resultant training load was lower on the eccentric than concentric portions of the movements, but the training load difference varied across each muscle group. 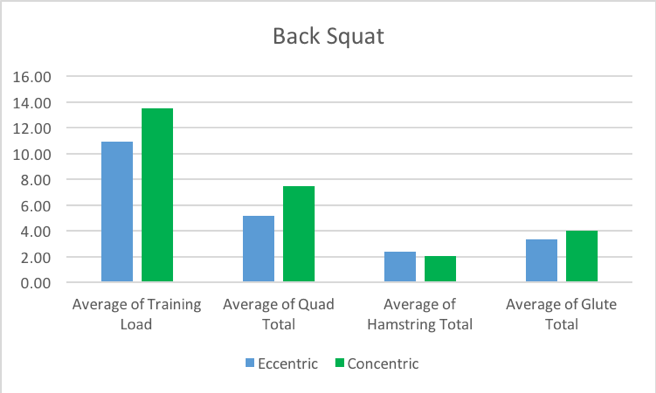 Respectively, back squat and deadlift had 34.1% and 28.5% less training load comparing eccentric and concentric portions of the movements. Squat: Overall, the eccentric phases saw 34.1% less training load across squats sets, but the difference in eccentric and concentric load was athlete and muscle specific. 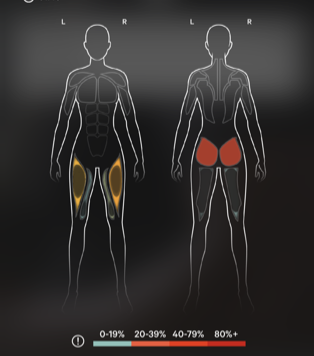 For example, in one set, figure 5, the eccentric load was 44.3% less across the quads and 20.8% less for the glutes, while hamstrings were nearly equal. This finding is consistent with the primary movers of the squat and the muscles at greatest length in the eccentric phase. Deadlift: Overall, the eccentric phases had 28.5% less training load across deadlift sets. Each muscle group produced less training load in the eccentric phase with the hamstring showing the smallest net difference, 16.41% less eccentrically. 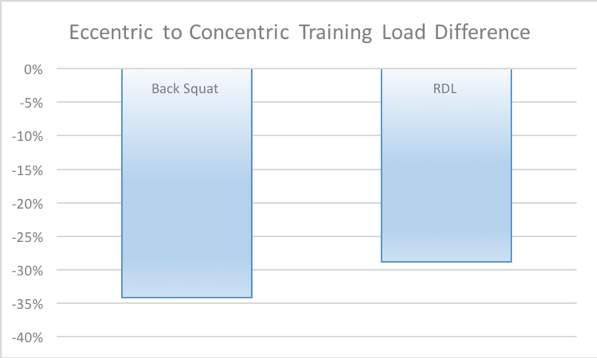 In Figure 6: see that the glutes had the largest net difference, 40% less eccentric load vs. concentric, which makes sense as the glutes are the most lengthened of the muscle groups in a deadlift. 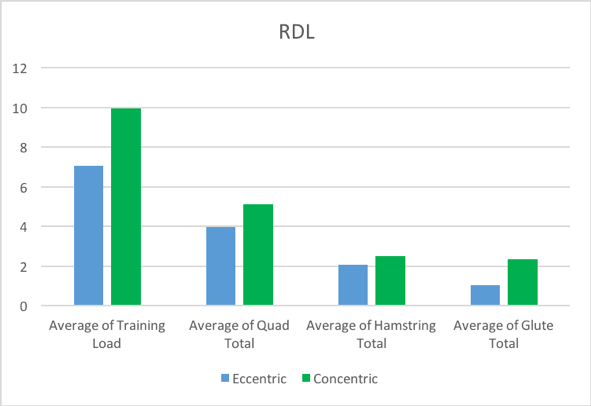 Our findings show that the eccentric and concentric training load differences were most significant in the muscle groups with the most length in each movement. This finding, where a muscle at length has less training load recorded through sEMG is consistent with current research on muscles producing more force with length due to their active tension and reduced recruitment of motor units. The bottom line is eccentric training is critical in sports performance as it maximizes force absorption and load transfer, power development, max strength and speed, and helps reduce injuries by strengthening connective tissues in lengthened positions. Understanding these concepts related to eccentric training will greatly benefit your programming and your athletes in the long run. By using Athos to monitor muscular training load, coaches can quantify that eccentrically focused plans are being executed with enough load and intensity for their athletes to reap the benefits of eccentric training.